Northwest Membrane Operators Association (NWMOA) formed March 26, 2012 is the newest affiliate of the American Membrane Technology Association (AMTA) dedicated to the Northwest United States region including, but not limited to, Alaska, Idaho, Montana, North Dakota, Oregon, South Dakota, Utah, Washington and Wyoming; as well as the Canadian Province of British Columbia within the limits of its resources. 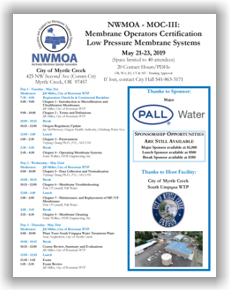 NWMOA is a membrane operators group that has been formed to provide membrane operators a forum to exchange information, share experiences and knowledge, obtain training and acquire continuing education credits necessary for Operator Certification requirements. NWMOA is an organization that is for membrane operators, run by membrane operators and has been established to meet the technical needs of membrane operators. The number of membrane based treatment plants is growing rapidly in the northwest. With that growth there is a need for an organization dedicated to the education, training and networking of people involved in membrane technology. 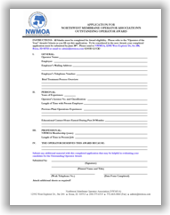 NWMOA is dedicated to filling that need, with our focus on training membrane plant operators.